1. As disciples of Jesus Christ, our vision is to promote the growth of the church by being alive in the Spirit, by sharing the grace of Christ with people of all colors and beliefs, and by proclaiming our faith in God to our community. 2. To develop and establish a strong Local Church which will challenge, empower, influence and impact the people on a global level with the Good News of Jesus Christ. 3. 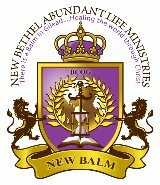 To empower church leaders through our New-Balm Academy Of Higher Learning” who will be skillful in the Word of God and who will embrace who they are in Christ, reaching their fullest potential in Him and therefore making a lasting difference in the lives of others. 4. To inspire men and woman to apply the Kingdom principles of God as a relevant and practical guide in their daily relationship, which when followed, enhances marriages, family values, and heal relationships. Also promote successful careers and improving social order. with each other and who are committed to serving God by serving others.